ROME, Jan 01 (IPS) - Of the 69 journalists who died on the job in 2015, 40 per cent were killed by Islamic militant groups like Al-Qaeda and Islamic State. Startlingly more than two-thirds were targeted for murder, according to a special report by the Committee to Protect Journalists. The Committee to Protect Journalists (CPJ) said in its annual reprot that nine of those killings took place in France, second to Syria as the most dangerous country for the press in last year. Globally 69 journalists were killed due to their vocation, including those slain for their reporting and those caught in crossfire or in conflict. The total for 2015 is higher than the 61 journalists killed in 2014. The CPJ says it is investigating the deaths of a further 26 more journalists during the year to determine if they too were work-related. In 2012, 2013, and 2014, those killed in Syria exceeded those than anywhere else in the world. But the fewer number this year dying on the job in Syria only means it is so dangerous that there are fewer journalists working there, said the report. Many international news agencies chose to withdraw staff anf local reporters were forced to flee, said the CPJ. The report cited difficulties in researching cases in conflict including Libya, Yemen and Iraq. CPJ went on a research mission to Iraq last year investigating reports that some 35 journalists from the Mosul area had gone missing, were killed or being held by Islamic State. The militant group has a grip on the city so the CPJ said it could only confirm the deaths of a few journalists. The committee's report said it had received reports of dozens of other journalists killed but could not independently confirm the deaths or if indeed, journalism was the reason. It said several of these journalists are currently on CPJ's missing list. A mural for Avijit Roy in Dhaka, one of four bloggers murdered by extremists in Bangladesh this year. Credit: AP/A.M. AhadThe Charlie Hebdo massacre that took place in Paris last January was claimed by Al-Qaeda in the Arabian Peninsula. Eight journalists at the satirical magazine Charlie Hebdo were targeted. Islamic State in October murdered two Syrian journalists living in exile in Turkey, Fares Hamadi and Ibrahim Abd al-Qader. Abd al-Qader was given CPJ's 1015 International Press Freedom Award as he was an early member of Raqaa is Being Slaughtered Silently, a Syrian citizen journalist group. 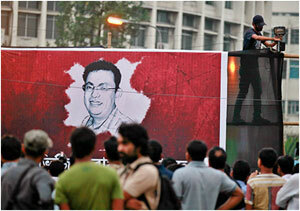 "In Bangladesh, members of an Al-Qaeda affiliate or another local extremist group, Ansarullah Bangla Team, were suspected in the hacking or stabbing murders of a publisher and four bloggers, including U.S.-Bangladeshi writer Avijit Roy, who was attending a book fair when he was killed,"said the report. The Taliban in Pakistan claimed responsibility for the shooting of Zaman Mehsud, president and secretary-general of the Tribal Union of Journalists' South Waziristan chapter and reporter for the Urdu-language Daily Ummat and Daily Nai Baat newspapers. 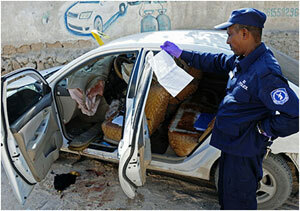 A security officer investigates the murder of Somali journalist Hindia Haji Mohamed, who was killed by a car bomb in December. Credit: AFP/Mohamed AbdiwahabIn Somalia, Hindia Haji Mohamed, a journalist and the widow of another murdered journalist, was killed in December when a bomb blew up her car in an attack claimed by the Islamic militant group al-Shabaab. Governments around the world were jailing at least 110 journalists on anti-state charges. This is out of 199 total jailed, according to CPJ's most recent annual prison census.—It shows how the press is being cornered and targeted by terrorists and also squeezed by the squeezed by authorities saying there were committed to fighting terror as well, it said. More than two thirds of the journalists killed in 2015 were targeted and murdered as a direct result of their work. The report said about one third of journalists' deaths worldwide were carried out by criminal groups, government officials, or local residents who were, in most cases, drug traffickers or those involved in organized crime. They included Brazilian Gleydson Carvalho, shot dead by two men while he was presenting his afternoon radio show. He was often critical of politicians and police Brazil had six killings last year, the highest since CPJ began keeping records in 1992. But Brazilian judicial authorities have made headway in combating impunity by getting six convictions in murder cases in the last two years, said the report. South Sudan registered for the first time on CPJ's index of slain journalists when unidentified gunmen attacked an official convoy killing five journalists traveling with a county official. The motive is still unknown but there have been various accusations. Some say this could have been the result of the power struggle between former Vice President Riek Machar and President Salva Kiir which set off the civil war in 2013. The murders of the five landed South Sudan on CPJ's Global Impunity Index, which highlights countries where journalists are murdered and there is no one held responsible so their killers go free. South Sudan, Poland and Ghana appeared on CPJ's killed database for the first time. In Poland, Łukasz Masiak, was fatally assaulted in a bowling alley after telling colleagues he feared for his life. He was the founder and editor of a news website and reported on crime and drugs and pollution. In Ghana, radio reporter George Abanga, was shot dead on his way back from covering a cocoa farmers dispute. •	Seventeen journalists worldwide were killed in combat or crossfire. Five were killed on a dangerous assignment. •	At least 28 of the 47 murder victims received threats before they were killed. •	Broadcast reporting was the most dangerous job, with 25 killed. Twenty-nine victims worked online. •	The most common type of reporting by victims was politics, followed by war and human rights.